In the highly romantic times of the park’s inception, predators of the area had a bad reputation. Anything that could harm life in the canyon was a threat, even if it was part of the life itself. Theodore Roosevelt was highly influential on these matters. 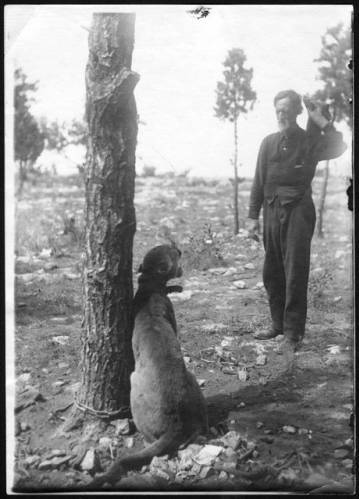 He loved the mule deer of the park (mainly for their game value) and made efforts to have predators like mountain lions, coyotes, wolves, and bobcats killed off to protect the deer. This went horribly wrong. The deer became wildly overpopulated and did not have a food source large enough to sustain them. Public outcry was massive when guests saw deer dying of starvation. To solve this, the forest service allowed hunting again in 1924 to try to control population. This angered people further because it went against the exact values of a national park. They also attempted moving some through the canyon to the South Rim. Community members like western author Zane Grey and director DW Griffith, Navajo Indians, game wardens, and Forest Service personnel gave it a good attempt as well. Apparently taming and herding wild deer was not as easy as it seemed. The deer drive of 1924 would have been an incredible tale, and an even better movie (as Zane and Griffith were planning), if it hadn’t turned out to be a complete failure. Other measures like truck and air transport to the south rim were attempted in the late 20s. Trap and ship methods were employed again in the 40s, taking them this time to Desert View. By the 50s, Arizona Game and Fish was put in charge of transferring surplusses to southern Arizona. 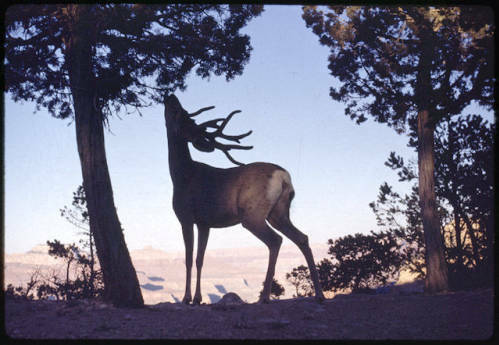 [Mule deer on the rim of Grand Canyon - With head up and antlers back, it appears to be nibbling on pine needles].